I have a Synology File Server. When I connect to it using a Windows 10 Machine, I am able to right click on a folder and select "Always available offline". When I am on a server running Windows Server 2016, that option is not available. According to this article, I need to add the 'Desktop Experience' feature before File Sync is available - however, I do not see that Feature in the list of available features. 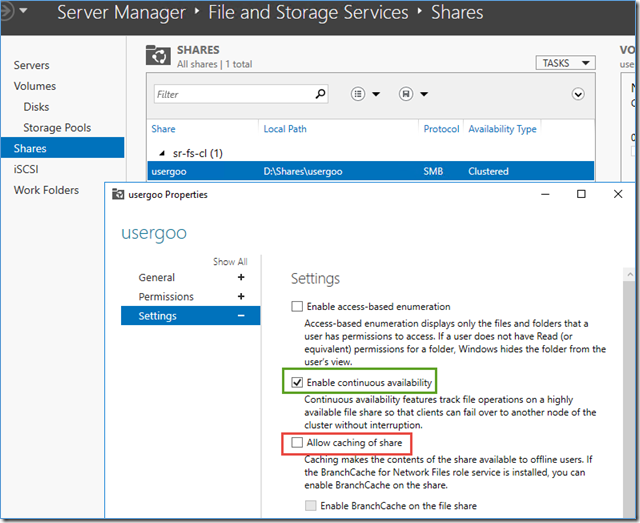 How can I get offline files to work in Server 2016? When you install Windows Server 2016 using the Setup wizard, you can choose between Windows Server 2016 and Windows Server (Server with Desktop Experience). The Server with Desktop Experience option is the Windows Server 2016 equivalent of the Full installation option available in Windows Server 2012 R2 with the Desktop Experience feature installed. If you do not make a choice in the Setup wizard, Windows Server 2016 is installed; this is the Server Core installation option. From the doc the support in server OS was up to 2012R2 on what I see. In case the doc lie, Just make sure the folder is set in CSC, not CA in example. Edit: striked the last reference, the share is not hosted on a windows. Not the answer you're looking for? Browse other questions tagged windows-server-2016 or ask your own question. Does Always On in Sql Server 2016 work better with Windows Server 2016?